3) Can you provide references? (Naturally almost all walkers will provide positive references of existing clients, but it is important to contact these references to have a quick discussion and get honest feedback of any concerns you may have). 4) Where do you take the dogs? 5) What breeds of dogs, and more importantly, WHAT ARE THE PERSONALITIES OF THE DOGS that will be walking with my dog? 6) What training techniques do you use? 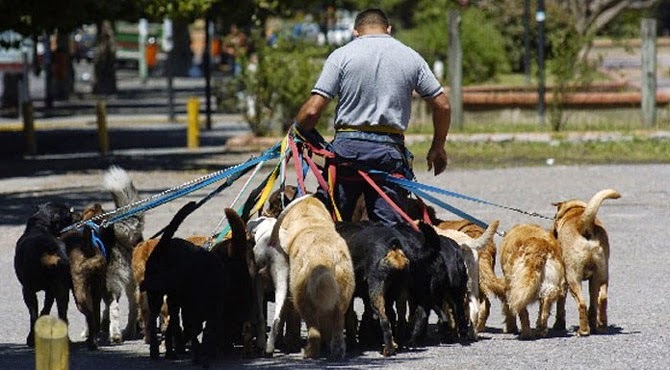 While some dog walkers are certified trainers, the majority are not. Therefore, you want to ensure that your walker is using the same techniques that you use at home. This is important, as each dog is trained in a different way, and different methods work for different people and dogs. As a dog owner, it is extremely important when meeting a prospective walker that you are completely honest about your dog's behaviour. Don't be ashamed if your dog tugs like crazy on the leash or exhibits some aggression toward a particular size or breed of dog. Remember, the more the walker knows, the better equipped he or is she in providing the care to ensure that your dog has a great experience out of the home. One final thing : Don't think that outings to a local park are more beneficial to puppies, or that smaller breeds will be overcome by all of the activity. It is my personal experience that while the older dogs often stick to themselves and avoid the "roughhousers", they are always just as excited to go on an outing and the exercise is very beneficial. With regard to the smaller breeds, keep in mind that in most cases, it is the little guys and gals that keep their larger counterparts in line!! !